TightScrew non-loosening tension rods were created by long-time professional drummer Carl Scott in his quest to find a solution to the long-standing problem faced by thousands of drummers worldwide: drum de-tuning! Since the product’s inception in 2004, thousands of drummers have relied on TightScrew Non-Loosening Tension Rods to solve their drum loosening issues. We manufacture non-loosening tension rods to fit modern drums manufactured by most all foreign and domestic drum companies (**see a couple of exceptions in our FAQ page). Yet TightScrews are also very effective for use on vintage drums and are a great replacement option for rusted and worn out vintage tension rods. Customers often contact us at the suggestion of their drum company, asking for help. Will TightScrews solve the loosening issues on their new and expensive brand snare drum? The answer they are given is always a definitive “YES”. We are honored that those drum manufacturers have the same confidence in the performance of our product, as thousands of our drummer friends worldwide. TightScrews are manufactured to exacting standards using actual drum tension rods, not an external Gadget or Widget. Many of us have tried other solutions to solve the loosening issues on our drums-snares especially. Most or all other products on the market require changing the look of your drums, or require installing, using a tool, or shifting an item in order to tension or loosen the drum. 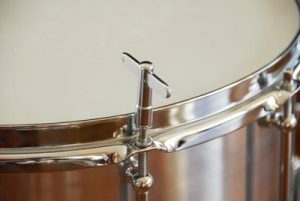 Once drum tuning is accomplished, that same item must be moved or re-installed. Your drums do not have the same factory look. When you change to TightScrews your drum’s appearance remains the same, and heads can be changed or adjusted without using special tools or removing some external gadget. Since 2004 I’ve been committed to providing personalized service, and complete customer satisfaction to all our drummer friends and customers. Ask any TightScrew user about their experience with our product and our company. 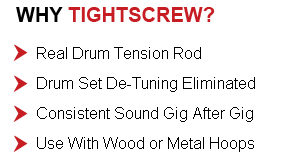 I am proud to say that TightScrews have helped drummers maintain “their sound” under all playing conditions. TightScrews have eliminated stressful and time consuming tuning breaks during performances and sessions.